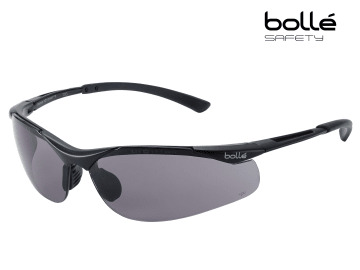 The Bolle CONTOUR Safety Glasses are protective glasses, which have a solid, comfortable and lightweight design. The frames have non-slip TIPGRIP temples, and an adjustable non-slip nose bridge. 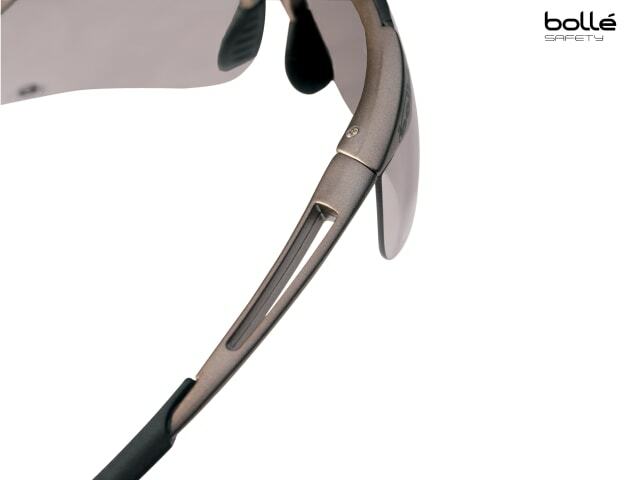 The lenses have an anti-scratch and anti-fog Platinum® Coating. These Bolle CONTOUR Safety Glasses have smoke colour lenses. They are approved for permanent wear and certified with perfect optical quality. Designed and used for protection against UVA/UVB and solar radiation, 99.9% UVA/UVB protection. Lens Conforms to: EN1661F/EN172-Solar 5-2.5.